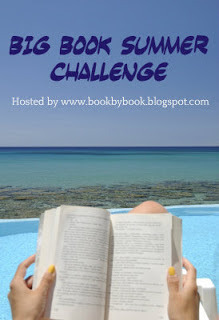 This seasonal challenge is being hosted by Sue @ Book By Book. My goal is to read at least one big book this summer. Which one should I read first? Is there one hear that you've read and loved? Let me know, please! Looks like a great selection to choose from! Some of those are pretty hefty. As you noticed, Dragonfly in Amber is also on my Big Book Summer TBR, so I hope to get to it. Enjoy your Big Books and be sure to come back to the challenge page to link up any reviews or updates! Good luck! You have some very big books on your list! Unfortunately I haven't read any of these books. My recommendation would be to start off the summer with one of the shorter ones and then move to the longer ones on your list. That's what I do every summer anyway!